HP Officejet 5742 e-All-in-One is a good-looking device with a design that supports printing, scanning, copying as well as faxing. The multifunction device is customised to suit the requirements of small office and home with professional quality output and a full range of wired and wireless connectivity. The e-All-in-One measures 17.8 inches in width, 19.8 inches in depth and 7.6 inches in height. A 6.75 inches LCD touchscreen is incorporated at the front to accommodate easy navigation. The black colour text can be printed at a speed corresponding to 21 ppm with a crisp and clear output that meets the professional standards. Automatic duplex printing is supported that makes printing economical and more convenient. A pair of HP Officejet 5742 e-All-in-One ink cartridges are provided with a black and tricolour. Furthermore, the multifunction inkjet supports printing conveniently from Android and iOS smartphones and tablets. It also supports memory card printing and web printing. In case you need to print from PC, USB connectivity option is given. HP Officejet 5742 is a device that scores well in printing quality, speed and compatibility. Moreover, it offers all multifunction operations in a single device which saves a lot of space in a small office environment. Printing task can be made more economical with compatible HP Officejet 5742 e-All-in-One ink cartridges. Presence of wireless connectivity, ADF, automatic duplexing and fax makes it a good option for small business and home office users. How to resolve cartridge missing error in HP Officejet 5742 e-All-in-One? Step 1: Check for the ink cartridges compatibility. Make sure that you are using HP62xl which is compatible with your HP printer. The HP Officejet 5742 e-All-in-One ink cartridges must follow the ISO standard. Step 2: Check for the installation of ink cartridges. Slightly, press the ink cartridge and remove the ink cartridge from the cartridge stack. Check whether the protective tape is removed or not. Remove if a piece of tape is present on the ink cartridge. Reinsert the ink cartridge back to its place. Check for all the HP Officejet 5742 e-All-in-One ink cartridges. Step 3: Check the electric Contact. Turn the printer on and remove all the USB connection with the printer. Open the cartridges access door. Remove the ink cartridge, by slightly pressing the ink cartridge and pulling it in the upward direction. Hold the HP Officejet 5742 e-All-in-One ink cartridges and check for the foreign particles or any dust particle. Clean the copper-colored contacts on the cartridge. With the help of lint-cloth and water, clean the electric contact in the cartridge carrier. Let the cleaned area dry for 10 minutes, place the ink cartridges back to its position. Step 4: Check for the ink cartridges that is creating a problem. Remove one of the ink cartridges and check whether cartridge missing error is still coming. If not then place the removed cartridge back to its place and remove the other and check again. Replace the damage ink cartridge with the new one. Even if you are unable to resolve the issue, then call for the HP Service Center. Q. What will be the shipping cost if I order HP Officejet 5742 e-All-in-One Ink Cartridges from this site? A. All the orders that are placed on this website will include some delivery charges that start at €1.99 inc. VAT. The delivery charges for the order may vary according to its weight. Q. Does this printer comply with the ENERGY STAR guidelines? A. 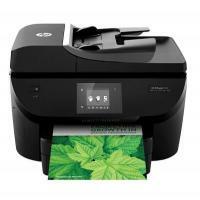 Yes, the HP Officejet 5742 e-All-in-One printer meets the ENERGY STAR guidelines for efficiency. Q. What is the maximum printing resolution that the HP Officejet 5742 e-All-in-One printer can support? A. This print can produce the maximum resolution of up to 1200 x 1200 rendered dpi in monochrome printing and up to 4800 x 1200 optimized dpi in colour printing. Q. When should I clean the print head of my HP Officejet 5742 e-All-in-One printer? A. If the diagnostic page shows steaks or is missing some portions of the text or coloured boxes, you need to clean the print cartridges automatically. You should clean the print head only when necessary. Unnecessary cleaning wastes ink and shortens the life of the print head. Q. Are your compatible HP Officejet 5742 e-All-in-One Ink Cartridges environment friendly? A. All our compatible ink cartridges are environment friendly. These cartridges are made from recycled cartridges that were used previously resulting in very little usage of new materials or components. They are factory tested to the same ISO standards as the original ones and offer you the benefit of eco-friendliness without compromising the print quality. Q. Can I purchase your compatible HP Officejet 5742 e-All-in-One Ink Cartridges in bulk or is there a risk involved in the cartridges drying up? A. Yes, you can purchase these items in bulk. To avoid the risk of drying up of ink cartridges, make sure that they are stored correctly in a cool and dry place and are used before expiry date printed on them. Q. Does the HP Officejet 5742 e-All-in-One printer support PC free printing? A. Yes, PC free printing is supported. You can print via smartphones and tablets using applications like HP ePrint and Apple AirPrint. You can also print directly from a memory card or USB flash drive without using a PC.